The key: pack one pair of shoes. In fact, most people who travel long enough slim down to one pair of shoes, and a pair of sandals for a full year of travel. I don’t do sandals, but I fully agree with one pair of shoes being all you really need. Shoes are not only bulky, but they are heavy. There’s two things which will push you to having to carry a larger, and often heavier bag: shoes and jackets. I’ve talked about picking the right jackets — they need to be compressible. Most people really only need one pair of shoes when they are traveling — and honestly the only reason you would need more than one pair is again: variety. There’s two things you will want in your travel shoes: versatility and comfort. Which is more important will really depend on the individual and the trip. You’ll want a pair of shoes which can cover the range of situations, and activities you will be doing. So if you travel a lot for work, your shoes should be equally useful in an office as they are exploring the town. In other words: sneakers are likely out for you. For personal travel you would want to be covering both exploration and a nice dinner. Or for more adventure travel, something which could go from hiking a trail to a nice dinner. Again, athletic shoes are probably out for most people. It’s not an easy task to find shoes like this. Personally, I’ve tried to find something which can handle a stroll through a park and all the way into a client office. Your situation and needs will likely vary from this. And then there’s family vacations where there’s just no way I am wearing anything but sneakers. People who live their lives out of one bag don’t have the luxury of adjusting their shoes on a trip by trip basis. You do. I do. So pack accordingly, just make it one pair which will work best for the things you will be doing the most, and passable for everything else. I personally use all leather shoes for almost all of my travel — unless it is to a theme park. I also look for something with a rubber sole on it (not leather). From there, it is just trial and error with fit, comfort, and style. Another couple options I have seen are Lem’s which are marketed as travel shoes and see to be closer to the Gobi’s listed above. Lastly, these Timberland shoes are ones I have been eyeing as possible candidates. There are tons of options, and outside of travel related blogs, Zappos reviews tend to be the best source of information on shoes. 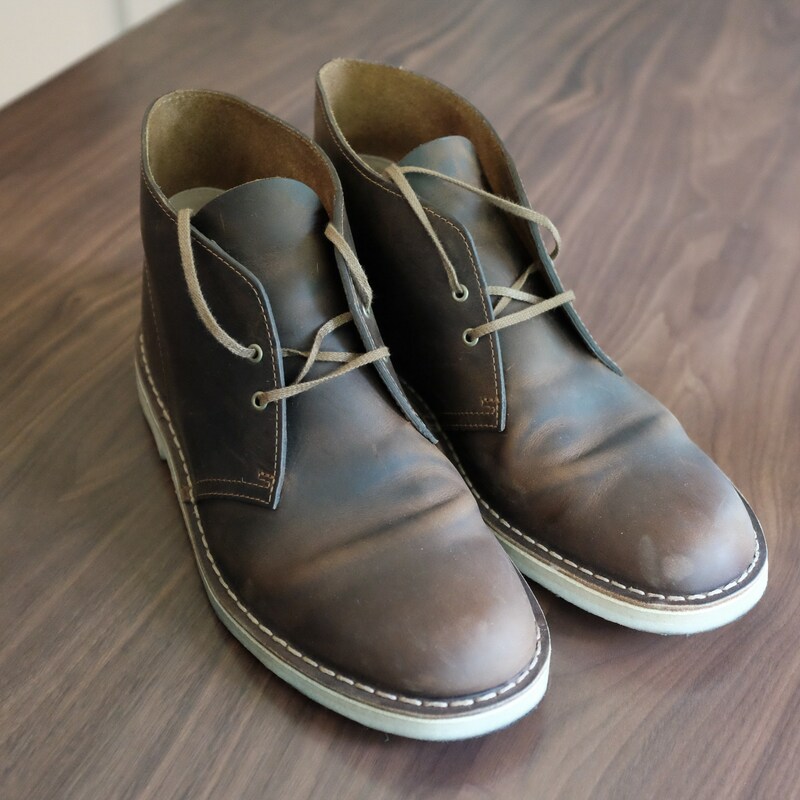 For the longest time I packed some Oxford style leather shoes, which I cannot seem to figure the brand of, but they were not overly comfortable past 5-6 hours of wear. At the recommendation of many sites, I’ve begun packing Clark’s Desert Boots, which take a bit of breaking in, but man are they nice. They wear well and are very versatile. It’s too early to state anything on their comfort, but I believe they will be plenty comfortable now that they are broken in. Pre-break in they were not the most comfortable shoe to wear. For family vacations to places like Disney, I am a big fan of wearing only athletic shoes. Personally I wear Nike Internationalists on those trips. They are very comfortable and I like the look of the shoe. At the top of my to-buy list is the Nike Flynit Lunar 3, which would be a great second pair of shoes to pack if you wanted to pack something like the Desert Boots, but have something for the gym, or running. These shoes weigh next to nothing, and look to pack down small. Find a pair of shoes you are comfortable wearing in all the situations you think you will be in, and wear those. Generally, if you can get through a day of airplane travel with the shoes, and not be in pain, they are going to be comfortable enough for your trip.